Some cook it fast and high. Some cook it slow and low. Some do it both ways. 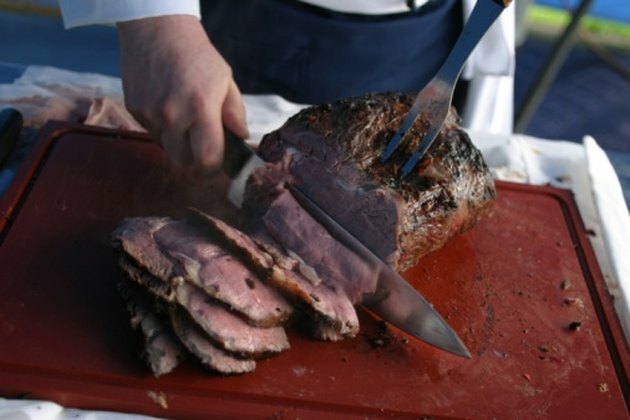 Roasting meat at a high temperature is best done if the cut of meat is small and the meat itself is of good quality. Tenderloin, top loin or sirloin are excellent choices. You can check the label on the meat at the supermarket to make certain that you are getting a quality cut. Cooking a roast at a high temperature is called searing. The advantage of searing is that the meat caramelizes or the natural sugars come to the surface and the proteins are browned, leading to better taste and look. Let the meat relax. Letting the meat sit at room temperature for about 20 minutes allows the moisture to reabsorb into the muscle fibers. This is called "relaxing the meat." If desired, add salt and pepper. Preheat your oven. After turning on the oven and adjusting the temperature to 500 degrees Fahrenheit, wait for the oven's warning signal -- usually a beep or the light going off -- meaning that your oven has reached the desired temperature. The principle behind searing is to cook the roast fast and high, so that the juices are locked in. If you are putting your roast in a cold oven, you are defeating the purpose; you will not be searing the meat. Use a shallow pan and do not cover the roast. When the hot air surrounds the meat, a crust is formed. If you cover the meat or put it into a Dutch oven, a crust will not form and the purpose of cooking at such a high heat will be defeated. Cook the meat for five minutes per pound if you want it rare, six minutes for medium, and seven minutes for a well-done roast. So for a 3-lb. medium roast, you would cook it for 18 minutes. Roasting the meat cooks it with a dry heat that completely encloses the roast, cooking it from outside to the inside. Turn off the oven. Let the meat sit in the oven for two hours. Do not open the oven door until the two hours have passed. What Temp to Cook London Broil?